Lamb Korma is an Indian Mughlai dish, in which lamb stew meat is braised in a cream based sauce and toasted Indian spices. This lamb curry is simmered for hours to reach the perfect tenderness and rich flavor. The word Korma or Kurma draws it’s origin from the Persian word Kormah, which literally means “braise”. 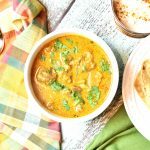 In this easy Indian food recipe for Lamb Korma, I braise the lamb meat with aromatics in a creamy coconut sauce. I season the sauce with toasted garam masala, and pressure cook it to a melt-in-your-mouth perfection. Note that this dish is sometimes called Mutton Korma.
. Garam masala is an Indian spice mix that includes, Cardamom, Cumin, Coriander, Cloves, Bay leaves etc. The garam masala spice mix is used in many Indian food dishes. You infuse these flavors in a yogurt, cream or coconut cream sauce. Traditionally, you simmer the meat in this sauce for hours over slow heat, till it becomes tender and gets infused with all the flavors. Pressure cooking the lamb helps infuse the spices with the meat, and the flavor is to die for. Also, I am able to cut down the cooking time from hours to less than 30 minutes. To learn more about the instant pot and many more easy instant pot recipes, check out my Instant Pot FAQ and Accessories blog. 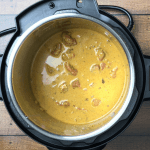 You can make the korma curry using three different cream bases- heavy cream, yogurt or coconut milk. My family loves the taste of a coconut milk based sauce, so that’s what I end up making most of the time. 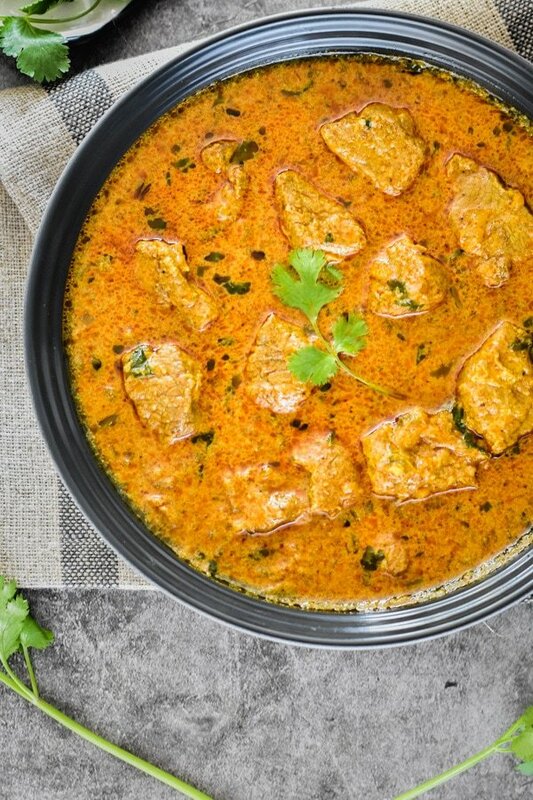 Using coconut milk also makes this dish is dairy-free, so people with dairy restrictions can also enjoy this amazing curry. Lamb korma and butter naan are a terrific Indian food combination. This lamb recipe also goes really well with a homemade flatbread called, Parantha, naan, cumin rice or nutty brown rice. 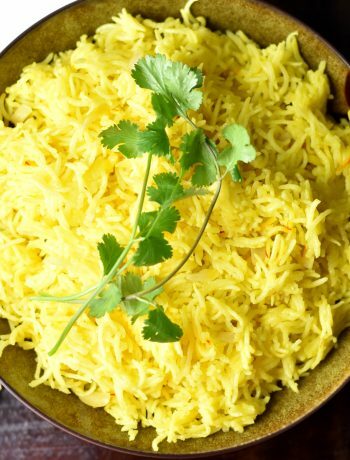 If you’re eating low-carb, you can have this with cauli-rice. I serve this with a side of garden salad with a simple lemon vinaigrette. The salad adds a beautiful contrast to the creamy korma, and adds some greens to your meal too! You can also make Chicken Korma with this recipe. 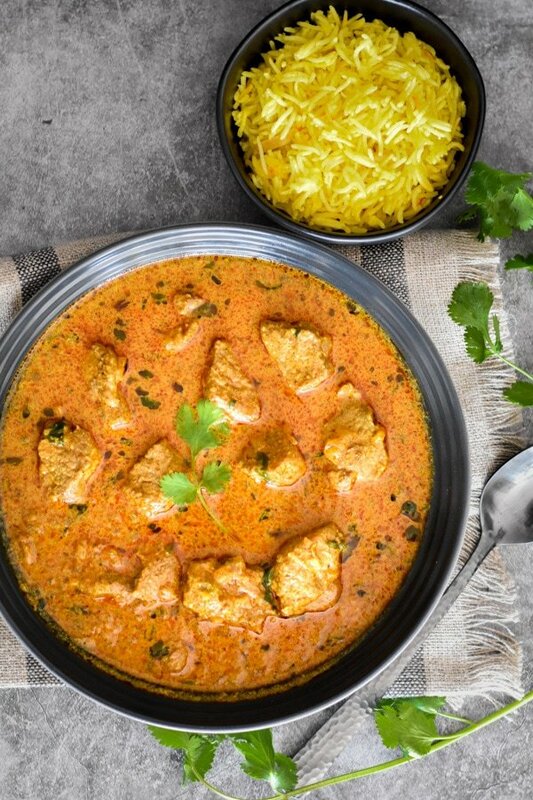 To make chicken korma, use boneless skinless chicken and reduce the cooking time to 5-6 minutes of high-pressure cooking. , but you can make this on the stove-top too. For a stovetop recipe, simply follow the instructions to make the sauce and simmer on medium heat for about 40-45 minutes, or till the meat is tender. Keep stirring every 10 minutes to prevent the sauce from sticking at the bottom. 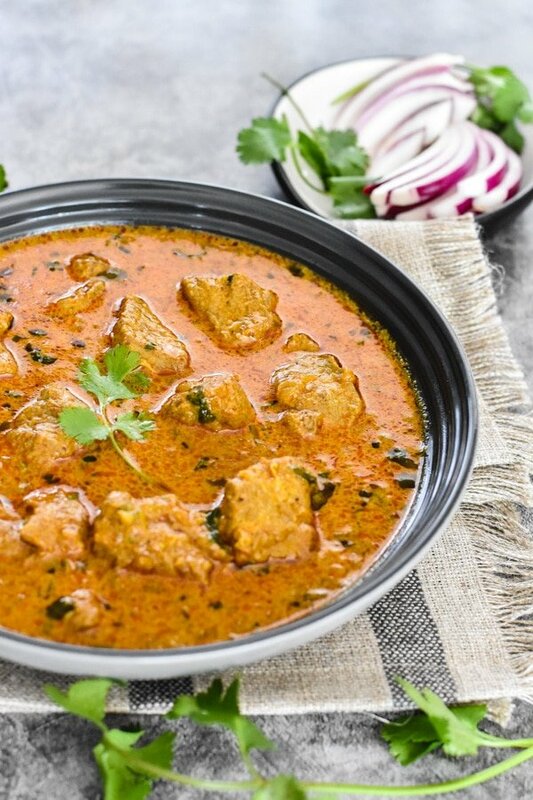 Lamb Korma is an Indian Mughlai dish, wherein lamb stew meat is braised in a cream-based sauce & bold Indian spices and simmered for hours to reach perfection. In this recipe, I shorten the cooking time using the instant pot. Prep: Chop onions. Fine chop, grate or grind peeled ginger and garlic. You can do everything together in a mini food processor. Start by pulsing ginger and garlic 5-6 times and then add onions. Cube the lamb leg meat and keep aside. Turn on Instant Pot DUO in SAUTE mode. Wait 30 seconds. Add oil, chopped onions and ginger-garlic paste and saute for 1 minute. Smart Tip: You can add a pinch of salt at this stage to speed up the sweating of the onions. Add tomato paste with 1/4 cup of water. This deglazes the pot as well as helps blend the tomato paste. Add all spices and stir well. Add coconut milk, rest of water and lamb cubes. Stir. Close the Instant Pot. Set valve to Sealing mode. Set Manual or Pressure Cook for 15 minutes. This time is perfect for the texture that my family likes, you can set it anywhere between 12-15 minutes, depending on how you like it. Hi There! Thank you and I hope you enjoy this recipe 🙂 As for the lemon vinaigrette recipe, it is posted here: https://spicecravings.com/quinoa-tabbouleh-salad. Sorry it took sometime to reply to your post, I am traveling so internet is a bit choppy:) Happy Cooking! Thanks for the recipe. This was very authentic and my family loved it. The lamb was so tender my daughter could “cut” it with her spoon. I only added 1/2 cup water and cut the time to 12 mins on high pressure. I didn’t add extra cardomom as I thought my garam masala had enough, but was wondering later if I missed out on some flavor that was supposed to be part of the tase of the dish. 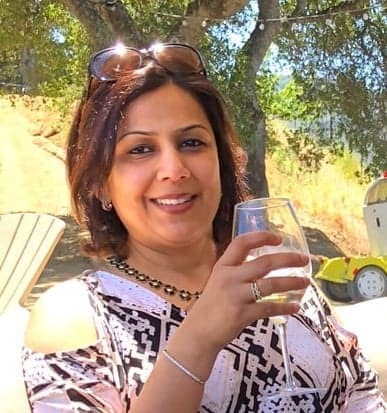 Hi Neelam, I am so glad your family enjoyed this recipe, thanks a lot for sharing that. I would highly recommend adding the freshly ground cardamom next time, it really enhances this dish. I would love to hear from you when you try other dishes! Thanks! This recipe was so incredible! I doubled it and added red bell pepper along with the onions. So good! I am really glad I found your website! Hi Kenady, That is awesome! I am super glad that you customized this recipe and enjoyed it, it’s a favorite in my home 🙂 I really appreciate your sweet words! Thank you! 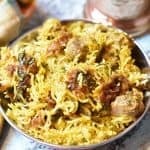 I my daughter is a big fan of potatoes in curry, just wondering if I’d need to adjist anything ? I’m thinking maybe if I use beef it’d be better as the beef takes a little longer to cook. Hi Natasha, potatoes go really well in this curry. Just cube them and add them, no time adjustment needed. This cooking time is enough for potatoes to cook through and become creamy. If you wish to make this korma with beef, increase the pressure cooking time to 30 mins, NPR. Hope your daughter loves it! Can I make this with beef ? If yes, should the cooking time be adjusted ? Hi Esther, Absolutely! If you’re making this with beef chunks, increase the cook time to 30 minutes, with a 10-15 minute natural pressure release. Hope you love it! I also like a thicker korma. How do I keep my coconut cream from curdling/seperating in the instapot? Is it the same as with tempering the yogurt?… Or could i use an immersion blender to re-emulsify? I make Thai coconut milk soups often. Never in my instapot but, on the stove top so that i can control the heat to not let it boil. Texture is important to me. Thanks Aneesha, this is a fantastic recipe. This one will be on high rotation in our house from now on! HI! If I choose to use the yogurt instead of coconut milk, do I still add it at the same point in the recipe? Often, yogurt seems to curdle if added during pressure cooking in instapot so I see many recipes suggest adding it after the pressure cooking is done. Please let me know what you suggest with this recipe. I’m excited to try and make this. I make a lot of your yummy recipes. Thanks!! Hi M! So glad to hear that you’re enjoying my recipes, thanks for sharing that, it always makes my day! You can add yogurt instead of coconut milk, and add it at the same point. I beat/whisk yogurt to a smooth consistency and add it a tbsp at a time and stir. This tempers the yogurt and helps it blend with the onion and spices and prevents curdling. 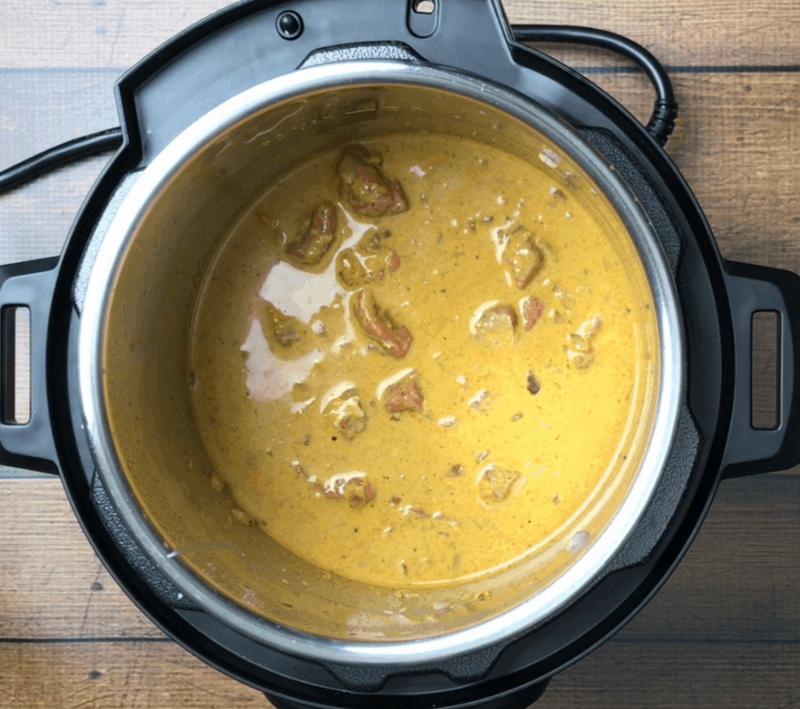 Check out the video in this recipe for clarity: https://spicecravings.com/no-cream-skinny-instant-pot-chicken-tikka-masala. Hope you love this Korma! Thanks for this recipe- just made it and it tastes amazing. Super easy to follow. Definitely making this again. I might try to figure out how to make the sauce a touch thicker/creamier next time, but this is just a personal taste thing and definitely not a complaint. Nice one! Yeah! So glad you enjoyed this recipe. You can skip the water next time. The lamb also releases some juices, so there should be enough liquid for the Instant Pot to come up to pressure. Hi Gery, by that I meant ginger ‘and’ garlic. I have made some changes to the text, and hopefully it’s clearer now. For this recipe, I use about 2 tablespoons of fine-chopped, grated or ground, ginger & garlic, which is about an inch of peeled ginger, and about 6 cloves of peeled garlic. Hope that helps. Does this mean 2 tbsp of ginger and 2 tbsp of garlic? Or 2 tbsp total? Hi Ben, it is 1 tbsp each. Roughly 1 inch ginger + 6 cloves of garlic should be good. Hope you enjoy it! Brown rice is not low carb. It has nearly the same carb content and glycemic index numbers as white rice. Hi Tim, I buy both kinds, white Jasmine and Brown Jasmine from Trader Joe’s. Here is what the label says: White Jasmine Rice: Total Carbs: 42g, Fiber: 0g; Net Carbs= 42g. Brown Jasmine Rice: Total Carbs: 37g, Fiber: 3g, Net Carbs=34g. So per every serving, there is a saving of 8g of carbs in Brown rice as compared to White Rice. I agree with you that every kind of rice has carbs, perhaps I should say “lower” carb instead of “low” carb. Thanks for pointing that out. And I do suggest cauli-rice as a low-carb option in this post.